stocking up for the build! It’s been a very productive 2 weeks getting ready for the build on Friday. The windows are almost complete up at CCS Restoration in Sanford, the Gramaticas gave me a list of lumber needed, and Danny at Machine Works is adding a couple of stabilizers to the trailer. I spent all day Friday and Saturday spending this period’s paycheck, but I have a lot to show for it. All framing wood from Interbay Lumber, a wholesale place here in Tampa, tyvek and roof membrane acquired from Home Depot. No one locally had the stainless steel bolts needed to bolt the framing to the trailer (haven’t come this far with aluminum to use anything but stainless! ), so I found a wholesale place online in Weymouth, Mass (bit of trivia, that’s where my sister Laura was born) who, even with the shipping costs, can get me what I need by Tuesday for about a third of the price from Home Depot. Yay! 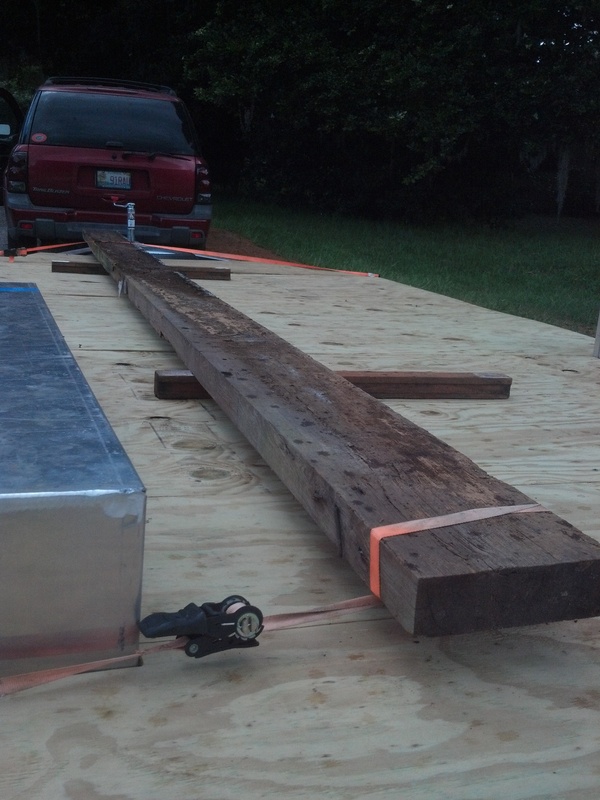 The most awesome acquisition though, is my ridge beam. In trying to do as much as I can with recycled and reuse materials, I am regularly visiting architectural salvage yards. In a convoluted twist of who knows who, my favorite local place, Schiller’s, had some heart pine timbers stored up at a millworks in Dade City. So I drove up there and found the perfect timber- 3″ thick, 9″ wide and 18′ long. Heart pine, solid as a rock. As we were loading it, Phil from the millworks mentions that it’s from a 1906 building torn down a few years ago. I hadn’t even thought to ask! It’s from the Parrish Train Depot, a place well known to the Florida Reenacting community! What an awesome piece of history to have included in my house! As I was poking around the millworks I found what appeared to be some tongue and groove unfinished flooring scraps. Turns out they are cypress slats used to separate loads of lumber when shipped. Acquired enough of those to use as porch flooring! Today’s projects include sanding the beam, treating for any critters, applying some oil preservative and cutting off the nails that are embedded. Then we mow the backyard in prep for next weekend! I can’t believe after all this planning and prepping, the build is finally here!!! !